Items are also available at our main office location at 40 Hazelwood Drive, Amherst, NY. Contact Cindy Fura at 716-631-5777 x 303 for in-person purchase information. with or without a puzzle piece charm. $5.00 or $7.00 including tax. $10.00 including tax. Insulated travel mug. $8.00 box design, $7.00 flat design including tax. this colorful band that is small in size but bold in statement. $4 or $2 including tax. you don’t want to lose on the other end. 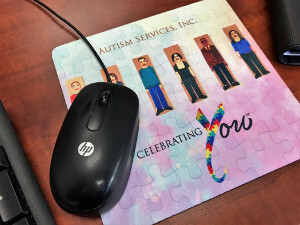 piece design help raise awareness of autism.